Someone once said that everything stops during a takeover, as people speculate on the direction of the fall of the axe. The sudden techtonic shift reminds us that companies are put together as human constructs and can quickly be remade. Our Finance Director Patrick Gracey has previously blogged on how to improve your chances of acquisition success. But in this blog, I want to focus on what the HR team in particular can do to prepare. The acquiring organisation will soon arrive with requests for existing data. Before they arrive, it’s worth documenting data sources, data owners and data quality. One recent client had more than 40 HR data sources across more than 20 countries. Another client had highly fragmented hierarchies, with 95% of its staff either orphans (line manager not listed or not identified in existing database) or in orphan groups (disconnected from the main org structure). Preparing a document listing data sources, owners and data quality prepares you for conversations about next steps. The core data needs to be ready. Prepare existing org charts and an existing headcount report. Reach out internally to get alignment with Finance data. Check Finance’s current numbers for heads employed per department and region and cross map against what the HRMIS currently shows. You are likely to need a data reconciliation meeting to identify and quantify any differences and to understand and explain why they arise. Is it definitions – FTE? Heads? Is it different monthly cycles for collecting data? Is it data errors or incompleteness, and if so, can HR and Finance agree what the sources of truth are? Having one view of the data will keep HR in the room when post-merger integration discussions are happening. What projects are currently being worked on, both in the HR department and in the wider organisation? How much time has been allocated to them, what are their objectives and budgets? Are they on track or not? Who is the person responsible for each one? What is the strategic importance attached to each one? How does strategic importance of each project translate criticality of delivery and workload for each person responsible? If possible, merge performance data to compare the strategic importance of the portfolio allocated to each person vs. their documented ability to deliver. What existing analyses are there in each area? What actions will need to be taken in all these areas in the first 6 months after a takeover? A few questions zoom in on the issues after a takeover. What are the key risk roles in each area? Who is the top talent in the organisation? What percentage of each area is identified as talent? What are the flight risks associated with each person? For a recent client, we have assembled a 1-pager on succession. Critically, it didn’t require a new system for the organisation – it just sat on top, gathered and presented data that already existed. Our developers had some fun with the content in this example, but the principles and layout are useful to share. 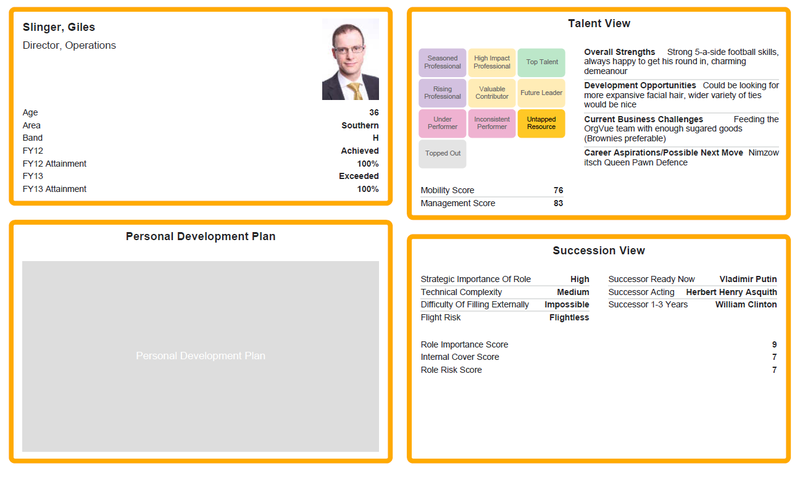 This 1-pager is used to bring together information about the person and the role so that the HR and management team can review the Talent team by team, and check for succession issues. If data can be obtained, it is very powerful to take a view of the acquirer. How is the acquiring business structured? What activities does it have? What likely areas of overlap are there? It is worth creating a first view of the other party, so that the organisation can start to prepare. In advance of any deal, good sources of data for this could include org charts published publicly and annual reports. After a deal has happened, or has been made public, you may be able to contact the internal (or the acquiring) deal team for information. Have you been in an HR team waiting to be acquired? Let us know your experience – we would be pleased to publish guest views on how to make the best of the time available leading up to acquisition.